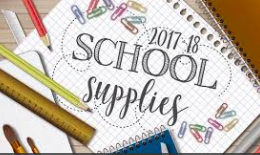 Click here for the list of voluntary school supplies for the upcoming school year. Students are not required to purchase these supplies. All supplies needed by our students will be supplied by the school district. Teachers have compiled the lists below to help guide parents who may wish to furnish the supplies for their child. This is not a requirement, but simply a list of suggested supplies. ☐Emergency ClothesOld clothes that can stay at school indefinitely,labeled with NAME and stored in large Ziplock bag, also with name on outside…Please include a top, bottom and socks, just in case of mud, water or other such situation. Kindergarten supplies are shared among the students; please do not label the supplies with your child’s name. Thank you. Please bring all the school supplies to the Kindergarten Welcome Wagon on the first day of school. Look for the special drop off spot and deposit your supplies there. First Grade supplies are shared among the students; please do notlabel the supplies with your child’s name. Thank you. Please note these items will be shared with the class (for example, glue sticks, pencils and Kleenex…). It is not necessary to write your child’s name on the items they generously bring to school. Special education supplies are shared among students; please do not label the supplies with your child's name. Thank you!